Do you wish that your life would just slow down a little bit? That you could capture the life that you’ve always dreamed about but instead seem to be caught up in the busyness of day-to-day living? 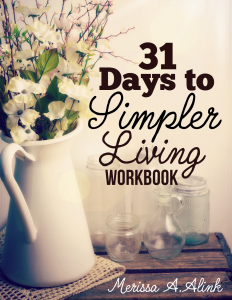 Here are 14 actionable steps towards simpler living that you can start right now. Do you ever had those days when you look back at your life and remember how far you’ve come? Sometimes I like to look back and then look forward to see when really started living this simple lifestyle we’d always dreamed about. It took a few more hardships and moving out into the middle of nowhere for me to really figure it out. Now I look at my days with a sense of accomplishment, but also with a sense of peace. We aren’t living the best lifestyle we possibly could just yet, but we are getting there and each day we are finally starting to feel more and more like we are allowed to live life instead of just try to get through it. Over the years I’ve learned a lot about the steps of moving towards a simpler lifestyle and today I thought I would combine the best ones for you in this article. I’m not saying these steps will be easy or that they are something you can accomplish in a week, but with dedication, you will be able to soon see a light at the end of the tunnel. Create a morning routine. This simply didn’t matter to me before we had children and now I understand just how important and necessary it is! Without a calm morning routine, our day will feel hectic and chaotic. This is the chance we have to set the mood for the rest of the day. I start my morning by waking up with the baby (about an hour or 2 before the rest of the family). Baby will watch me as I pick up the kitchen and house and begin preparing the meals for the day. If the weather is nice I will take the baby in his carrier and we go for a little walk. My goal in the morning is to have the house mostly picked up, supper started, and breakfast on the table by the time the rest of the family comes downstairs. I also like to have on some inspirational or calming music in the morning. Need help getting started? You might enjoy the Make Over Your Mornings Course. Kick the clutter to the curb. And I mean really kick it all the way out of your house. When we moved into the camper over 2 years ago we sold about 3/4 of what we owned and guess what? We don’t miss a single thing! Take it in pieces. Clean out one room at a time and then a few months later, do it again. Keep cleaning out until all you have left are the things you feel are beautiful and the things you really need. I do not own anything that I do not use less than once a week (besides canning equipment and seasonal clothing). Everything has a purpose or significant meaning. This is a very difficult step for many people, but I assure you that it’s 100% worth it. If you are finding decluttering difficult, read – How to Declutter Sentimental Items. Only do what you can. If you have too many things going on in your life that when you make it to the end of the day you wonder what happened, it’s time to cut the excess. Keep a schedule of what you actually do in a full day and then look over it the following day. Consider areas that can be simplified or cut out completely. If it’s creating stress it’s possible that it’s not worth it. Stop using electronics after supper. This was a hard one for me and something I only implemented recently. I tend to be a bit of a workaholic and it’s hard for me to put down the computer. But we made it a goal to let go of the electronics after supper, which opens up so much time for other things to get done or for family time. If work still needs to be done after supper I’m occasionally allowed to use my computer, but only after the kids are in bed. Create a cash budget. There’s nothing wrong with using a debit card or checks for paying bills, but we’ve found that life can be greatly simplified by using cash for everyday things. We use the Irregular Budgeting System, so our income goes to pay all bills first and then the rest is split up and those “extras” are kept as cash. Why? It greatly simplifies any money issues; you either have the money to spend or you don’t. And no more worrying about using credit cards or over-drafting a bank account. Clean as you go. I could not picture living a simplistic lifestyle without this step! When I’m baking or cooking, or even working on a craft project, I’m always cleaning as I go. (And usually with my homemade cleaners made with essential oils) This prevents me from getting to the end of the project and being so tired that I don’t want to clean up or from telling myself I’ll clean it up tomorrow and then it doesn’t get done. Tomorrow is just as busy as today. Clean up as you go! Skip trips to the store. Do you occasionally find yourself running to the store for just a few things? It’s time to stop. Not only are you wasting time and gas money on something that you probably don’t need right away, but you are adding in extra stress by being in the mindset that you need everything or can’t make do. In the pioneer days, pioneers would only make the trip to town after creating a large list. They knew how to do without and that to have those items would be nice, but they didn’t need them right away. They made do until it was time to go to town again, and when they did get there, they would stock up to have plenty to get them by until next time. The next time you need something, don’t make the trip to the store, make a list and wait until you have a nice long list before you make that trip. Make a simple stockpile. To go along with the above step – make sure you have created a simple stockpile so you don’t run out of those things that you use all the time. If your family eats a lot of beans, buy the 25-pound bag instead of buying the 2-pound bags. You can get plenty of tips on building your stockpile here. Meal plan. This is a big one! 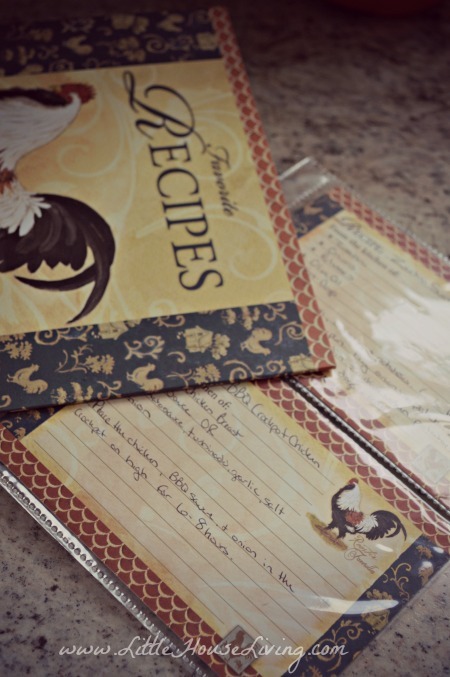 My favorite method of menu planning right now is using the Meals Binder. Meal planning is an incredibly simple way to make sure that you are not only planning out every bit of your grocery money, but it also stops the daily, “What’s for supper?” question. It only takes me about 10 minutes each week to create my meal plan. If you have trouble creating a meal plan and grocery shopping list of your own, I highly recommend either Build-A-Menu or Plan to Eat. Both are very affordable meal planning services that can save you a great deal of time! If you are so lost and think meal planning cannot work for your family, you need to read Meal Planning Made Simple. It will change your life! Minimalize your clothing. I never realized what a relief it was to have less clothing until I really cleaned out my closets. I’m not saying that you need to only have a handful of items to wear, but keep only a small, strategic amount of outfits that can be put together quickly. No more sorting through the closet deciding what to wear and no more unending piles of laundry to do. Learn more about creating a minimalistic wardrobe here. Here’s a quick tip…buy yourself some nice wooden hangers and only keep the number of clothing items for the wooden hangers that you have. We have a few sets of these Wooden Hangers. Take a walk. We’ve been trying to take at least one or two walks each day when the weather is nice. I love taking them in the morning with the baby to start off the day with a clear mind and we love to take one as a family later on in the day. It gives you a chance to be together, a chance to get some fresh air, and a chance to talk about the day. Create home “stations”. Create various stations in your home for different things. For example, in our house we have a mail station (for unpaid bills and unread mail), a “Go” station (for jackets, purse, diaper bag, etc), a reading station (books, pillows, blankets) and much more. 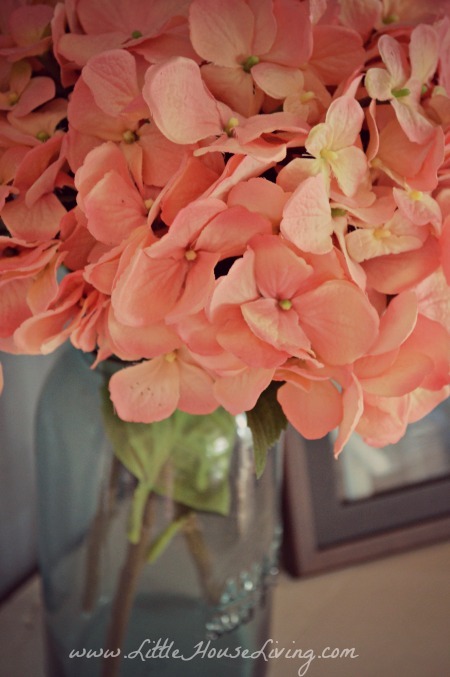 These make each room in our house more functional and create a place for things that otherwise might cause clutter. Play with your kids. This might sound a little silly, but if the weather is nice you can sometimes find me swinging on the swing set with my little Farmer Boy, seeing how far we can lean back on the swings until our hair brushes the ground. Or sometimes you might be able to find all 5 of us stuck inside a fort we built in the living room. Take some time each and every day to not only play with your children but be totally involved in that play. Be a child with them and laugh together. It will do your soul a world of good! Remove the negative things in your life. I think this is the hardest step, but it’s also the most important. Negativity has no place in your life. All it does is cause stress, anxiety, and issues. It’s easy to get sucked up in the drama and the craziness of this world and hard to remove yourself from it, but I promise, it’s very, very worth it. The next time something negative crosses your path, decide if you really need to be involved or if there is something you can do to remove yourself from the situation. Yes, sometimes that means un-friending a continual drama queen on Facebook or maybe something as uncomfortable as telling a family member that you need to have your space in a situation. But, as I said before when we started chatting about these steps – not everything on the path to simple living is easy, but it’s worth it in the end. Our lives aren’t perfect and they never will be, but I fully believe that we can live a slower-paced, simpler lifestyle no matter what. It’s all in the choices that we make along the way. Need more? If you are ready to fully jump into living a simpler lifestyle, check out my eWorkbook, 31 Days to Simpler Living! In it, you will find 79 pages of daily challenges, info and advice, and printable worksheets and checklists to keep you on track along your journey. 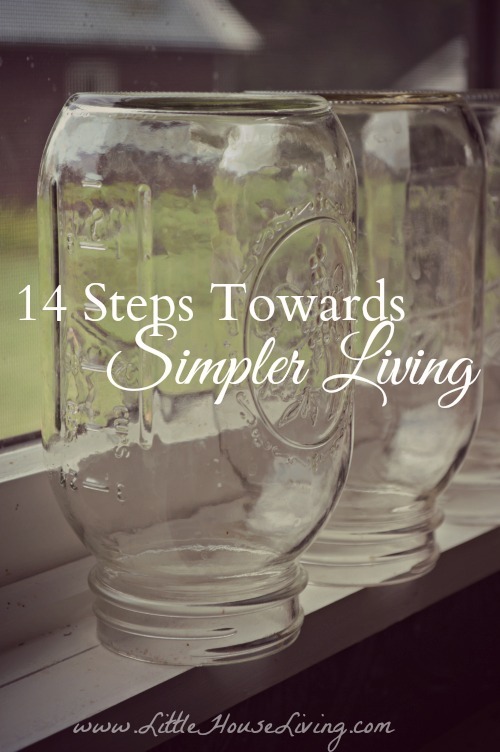 What are some steps you’ve taken towards simpler living and how have they worked for you? Which of these things have you done and what do you need to work on next? 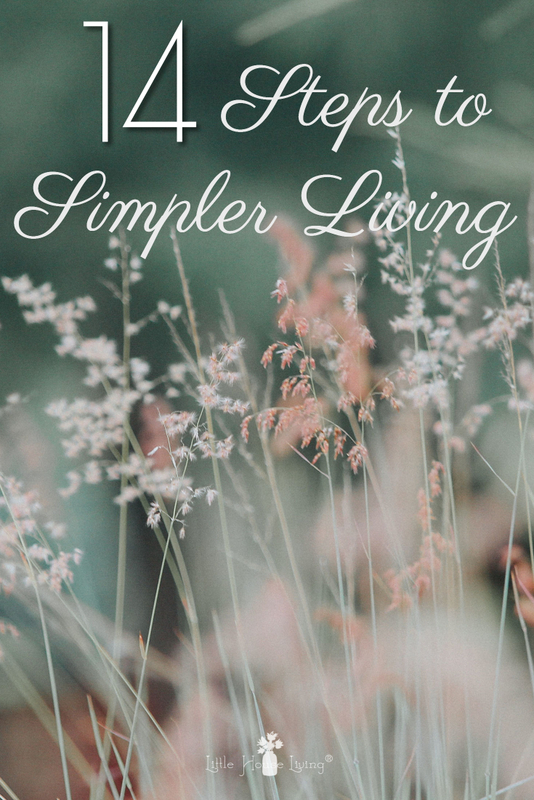 Ways to Enjoy a Simpler Lifestyle Living Simpler in February Living Simpler in January Definition of Simple Living Is Living Simply Still Possible in Today’s World? These are all really good tips! We practice most of them,in varying degrees,and have been for years.The one I struggle with is getting rid of things. As an example,I still have all of the little gifts and such that my kids made in early elementary school..they are now in their 30’s!! On a better note,we gave up the rat race along time ago. People tend to drive me crazy(can you say whine and complain? ), We use only money orders and cash..if we don’t have money,we do without. I shop in bulk at an Amish bulk food store and we combine trips. Another good tip..have only 1 vehicle. They are a huge money pit! I could go on and on with others we have learned over 30-plus years,but let’s wait and see what others say..this is a great topic! An idea for all of the little gifts, artwork, etc. that your kids made is to take photos or scan and make a scrapbook. It is easier to store and you can still remember what they made. I’m just starting my journey into a simpler life but the first thing I did was empty my many drawers of momentos from my daughters formative years and put them all together into a scrap book. It’s basic but I love flipping through it and remembering all the little minutes that have made up her life. Especially now that she lives over seas. One idea would be to pass those things on to your adult children. I have a ceramic angel I made in kindergarten that I cherish. It was given to me on my 25th Christmas. I own a consignment/thrift store that is located in my home. We have living quarters upstairs, except our kitchen is on the first floor along with the thrift store. Can you imagine what my home looks like with all the goodies that come through the store?! No, you probably cannot, because I’ve learned through the years to manage the items in my home. Basically using the mindset you’ve shared here. I, too, have learned the workstation concept and how to make sure every item has a special purpose or it does not stay. I make my home serve me, not me serving it. I’m so glad that you’ve taken the time to discuss this and to share the joy of non-clutter. We follow after peace and seek it in our lives and offer it to others who visit us and they always share with us their happiness from the peace in our home. One other point, about the clothing. When our children were young I discovered that no matter how many clothes they had, they always wore their favorites. I found I did the same as well as my husband. We got rid of all our clothing except for a week supply for each person and one dressy outfit. When we tired of an outfit or it wore out, we enjoyed buying a new “favorite” that had to replace one that was leaving. It might sound drastic, but to the kids, nothing changed since they only wanted to wear their favorites. It brought sanity to our clothing responsibility – no more storage issue, no more crammed closets and drawers and so much less laundry. And the benefit of a nice new outfit periodically. No you are not a terrible mom. I do it, too. It’s hard to stop and play with the kids when so much else needs done. I struggle with this all the time, esp since I am homeschooling three. There never seems to be enough time for everything, but I am learning to prioritize and that means sometimes setting the”pressing” things aside and doing the important stuff. After all, we are raising kids, not clean kitchens, or whatever the other “stuff” is, right? Ya know- I feel the same! What I realized by keeping a mental checklist is that I might not play lots every day but will play in cycles. One day I might just need to get stuff done which gives my dude a chance to help or play on his own. Another day I might play with him a ton. My hope is that it balances out in the end! My mum always told me , dishes can wait, sweeping can wait. Your kids are here only for a heartbeat, enjoy them while you can. My home may not have been as neat as some, but I had happy kids. Merissa, it helps my morning routine when I “put my house to bed” before I go to sleep. I tidy up the main rooms quickly, make sure the doors are locked and the curtains drawn, make the coffee, hang up my clothes or put them in the hamper, read my Bible & pray. Then I give the night to God and fall asleep. Before the kids went to bed, I made sure they too had a routine. Theirs consisted of picking up their belongings in the main rooms, brushing their teeth, setting out the stuff needed for the next day at school, praying, and then sleep. We all agreed that this system worked for us. Thank you for sharing this list! There are so many things here that I want to work on. Great tip! I love cleaning the kitchen while I’m cooking, it seems like the perfect time to do it! I hate to admit it but I have de-cluttered for years and still am hanging on to some items. I have only gotten rid of one item I regret so the odds are in my favor! The closets are shrinking and so many things have left. I look forward to when I take the final plunge and live with only what I feel is necessary. For me it is a process. We were offered some acres at pennies of the cost. I have been contemplating on saying yes because it is so far out in the country. This was a perfect read for me today. Hi Miriam! Our oldest isn’t quite old enough for preschool yet but we’ve started some things with him already. We are planning on homeschooling. And you can find some pics of our house here in the Farmhouse Renovation series. I especially lie your idea of taking 2 walks a day. Walking is such a great stress reliever! If you get up 2 hours before your family, what on earth time do you get up? This was a very insightful post, Merissa. It got me to thinking about all the ways I could simplify. My biggest hurdle right now is not planning ahead for meals. It’s weird how we sometimes do or don’t do things for ourselves that we know beyond a doubt would make our lives better. Thank you for all the tips. You are speaking to where I am right now. I also liked the post about drawing in our boundaries. I have learned to be very flexible over the years with homeschooling, home-keeping etc. I plan very well for these. I started to realize recently after our sons both taught classes at home-school co-op that they had become teachers, good students and even business persons. We stopped co-op this year in order to simplify our home, take care of wisdom tooth extractions, build a motorized bike. This will ready us for the next step. It is good to pull back and question your mode of operation and whether it is working for you. Mom needs to take good care of herself too! This is a great list! 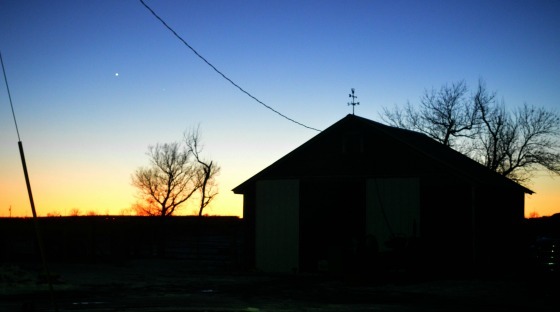 For my family just moving from the city to the country helped us live a more simple life. Removing negativity and starting your morning off right is important for any household… it’s not just important it’s mandatory to live happy!! Great tips. I always clean as I go. I feel “uck” if things are clean and where they should be. I’ve started waiting until I have a long list. Partially to save time and gas and partially to teach the other members living here to make things last, or eat/use in smaller portions. I need to practice some other things, but I’m on my way. I love, love, love, the tips. We have been using the cash only tip and agree it’s the best way to go. I clean as I go whether I’m cooking or crafting. Although we don’t have a lot of stuff, I see room for improvement by kicking stuff to the curb. I will take your suggestion of one room at a time. Also, I like the idea of just a few outfits as well. I think going into the cooler weather is a good time for me to implement that one. Thanks for all your suggestions. I am so sorry I posted here and used the wrong name..on your web page… ahh Please feel free to delete that one. Just another note to tell you how awesome your site is. I could stay here all day and learn, learn, learn. Thanks for all you do and share with us. Many blessings to you… and thanks again. Thank you for these tips and reminders. I fall into that trap of laziness way too often. With a grocery store only 5 min away it becomes too tempting to “run to the store” for this little thing or that. My husband and I are diligently working on going to cash for all spending but the bills as a way to better manage our finances. We are not there yet but what we have started doing has been a great stress reliever! I do find I am happier if I plan the meals, do major grocery shopping once a month (with plans to fill in with fresh produce and things that I can’t keep for more than a couple weeks before spoiling), pick up the clutter in the living room at night before going to bed and wake up to a clean kitchen. Your tips have given me the motivation I need to start cleaning out my closet and dresser and the garage where everything seems to get dumped and never used again! This is so encouraging to me and something I really needed to read at this time. Thank you!!! Not only simpler, but oh so much more harmonious when life has organization. What a great list!! I echo Betsey’s comments also about putting the house to bed – it’s a habit I’ve trained myself into the last couple of years without regret. Love the clothes idea and can’t wait to start working on it, too! Not making numerous trips to the store saves money and frustration, too. Especially now when prices are at an all-time high, yuck! Enjoy reading all the ideas and comments from everyone. good ideas. I am working on many of these tips already in the hopes of making my family less dependent on the outside world. I do not watch the news on tv anymore. I go online in the morning. If the world is still here i go on with my life. I love these tips, perfect for how I’ve been feeling lately. Getting up in the morning helps so much; it makes such a difference. Definitely going to check out the budget you mentioned; sounds very interesting. Thanks so much for sharing at Inspire Me Wednesday. Featuring you in this week’s issue. My all time fave – remove the negative things in your life. 🙂 These are wonderful tips. Although I still need to improve some of them in my personal life. Hey Merissa! I found this post on GTTuesday. I love your blog. These are great tips for living simply. Thank you for sharing. Love these tips Merissa. I have been learning a couple of them but they all seem so simple I just need to start a routine e and practice them. We live in the city and I’m a SAHM with my 2 year old and like you crave something simpler. I need days to be more routine and back to basics. Especially since I’m stuck in the city so Husband can get to work ( which is kinda important 😉 I love your nkog though and find it encouraging to learn new skills. Thank you. I just move with my boyfriend and those tips are exactly what I’m looking for. You wrote down exactly what I have tried to delineate by myself! I have to admit that get rid of things its the hardest part for me. Even if I move in another city (actually another continent, from Italy to Australia) I had a lot of difficulties chosing what to bring with me, and still now I believe that I have a lot of useless things, but I’m working on it! I am in the process of trying to find a slower pace in my life. I became disabled 14 years ago and have slowly improved my mental state a little. My husband has tried for years to get me to slow down and accept that I can’t do things the way I use to. I have bad arms. This past year I think I finally figured it out but not before letting the house get so far out of control it is taking me forever to try and decide what to do with it. Now I know that it is time to get rid of the wall to wall nic-nacs and furniture and make it to where I can clean house and keep up with it. My husband has helped all these years but I still slowly did the majority of it because he didn’t want to take my independence away. Well we are in the process of one room at a time trying to go through and totally clean everything and get rid of things. It’s very slow process and very hard on me as I was raised that everything was a hand me down and also an heirloom. So I have trouble letting go of things. I lost my Mom and Dad when I was a young adult. So I have trouble getting rid of anything that has meaning of family attached to it. Can you help with any suggestions. I’m ready to relax and stop stressing everyday on how I’m going to clean the house today. I’m ready to sit on my porch swing and watch the deer and wild turkeys in our yard. Hi! So glad I found this post on Pinterest… your blog is right up my alley! I grew up in Indiana watching Little House on the Prairie 🙂 I love your suggestions on finding simplicity as they can be used by anyone with any sort of lifestyle! I want to incorporate more “country values” to simplify my own life. I already love my morning routine & am always trying to minimize/organize things better. Your suggestion I loved the most was “skip trips to the store” because we can save time, money & energy by waiting and making a list. Added benefit is exercising patience instead of instant gratification! I found myself nodding at each point — great list. I am having trouble with meal planning because our life seems so helter skelter at times that what I plan for dinner tonight won’t happen for three or four more days. We always manage to eat together — just not what I had in mind:-) I thought I did a good job of keeping the clutter down until we started remodeling — amazing what has been stashed away in each room! Thanks so much for sharing. These are great tips. I have found out that during the years our life has turned less frugal as it was when kids were small. I specially liked the one that tells “take a walk”, I do believe that nature is a great healer. Put PLAYTIME with your children first…they will leave someday and your house will still be there along with everything you have to do! The housework, groceries,errands,paying bills and laundry will never go away…you will have plenty of time for that when your house is empty of children…I had 8 children – they came first and my house still was clean and clutter free. Bills got paid and groceries got bought. Meals and dishes got done…but if I could do it over again…I would have spent more time with the children…and less time worrying about how clean my house was! Yes I had a full time job- and no it wasn’t easy – but I wish I had of been able to play more than I did! Yes my house is clean all the time and nothing is out of place. But there is no laughing , no one that has a monster in the closet, no one that needs anything…just me…trust me the house can wait- the children grow up way too fast and are gone far too soon! Hi, thank you for these wonderful tips. We live 42 kms from the town where we go to church and do our major shopping. I go only twice a week, once on Saturday mornings for music lessons and on Sundays for church. This is great, I don’t need to be running in to town for nothing and I really enjoy being at home. Your ideas of having a calm morning and being organised are a great help and a good reminder to me. Thank you again and Blessings to you and yours. Wonderful tips! Every family, whether in the town or country, can benefit from these. Do you have a “clean as you go routine” for the household chores? I’d like to hear what your routine is. Thank you! 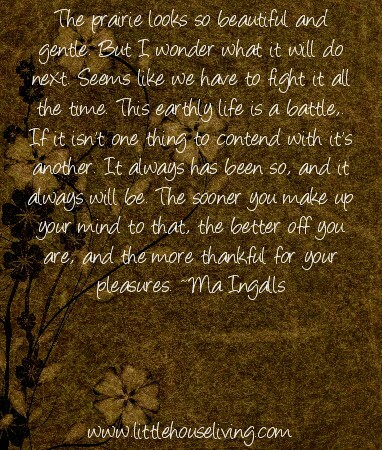 As I read this, I felt the stress slip away and I felt immersed in your lifestyle. It is the life my husband and I crave. We plan to downsize and live minimally in a few years. Your tips will be a huge help. These are wonderful tips! I’m working to simplify our lives. We have a long way to go yet. We’re in the process of downsizing and will be decluttering before we pack and again as we unpack. I’m learning to cook so much more at home and we enjoy healthy delicious food while saving. I struggle with negativity, my neck and shoulders tighten up when I am hearing it. I’m getting better at excusing myself or changing the subject. Thank you so much for these wonderful ideas! Great post Merissa! We moved on to a home where we could build our homestead. Having only been here for a few months, I am in that stressful stage. I am feeling refreshed that others go through this too and am looking forward to working on some of these tips you posted about! Thank you for this article — I am in my mid-50’s and have only recently started the “process” of simplifying my life. I have a long way to go…but am determined to follow through. Great ideas. Having stuff is burdensome – everything we own needs to be maintained. Spending time building memories and relationships is a lot more important than getting the best score on a video game. Our life is so complicated… I would love to implement every one of these steps. I really wish I could lay my world/life out to someone and have a brain storming sesh to find ways to get to a simpler life for us. I dream of being a SAHM one day, and I want to change certain things now so that dream can become attainable. Thank goodness we don’t have children yet! We are currently saving to build a home and we just bought almost 19 acres down a dirt road in a small town. My husband is a semi driver for UPS and let me tell you… the schedule is forever changing! He works 12-14 hour shifts and this week he goes in at 3PM and doesn’t get home until 3-5AM the next morning OR it could be backwards OR it could be any time of day/night that he goes in. We find out the upcoming weeks schedule the Thursday before… This kills me because I am a planner & like routine! We live in a double wide and I have been buying things for our future home and on top of that, we have ALL of our wedding gifts packed up and we are saving them for the future house… Can you say “clutter” ?! I also don’t have a real closet… I am using a mobile rack & plastic drawers in my dining room… needless to say we eat on the couch. I know I have a lot of clothes/accessories but it looks worse because they don’t have an actual place. On top of that we have so many “kinds” of clothes – His uniforms, nice-going out clothes, my work clothes, church clothes, lounge clothes, yard work clothes, hunting clothes…. its ridiculous! I LOVE buying in bulk…. so to add to the aforementioned clutter, you have packs of toilet paper, paper towels & because I refuse to pull out my new plate sets, we have plastic cups and paper plates in bulk. Because we live in a sketchy neighborhood I get no quality of sleep on top of lack of quantity because of my husbands schedule, So I am constantly sneaking in naps… like, 3-4 hour naps. Time that could be better spent being productive. I’m about to have a nervous break down…. Moving CAN NOT come soon enough!! I’ve had a lady refer to me as being the extreme opposite of a horder. I don’t like cutter so I get rid of alot, but I’m getting better about keeping things that are seasonal so I don’t have to purchase them again. It took me a while but letting go of negative people in my life has helped a lot! The lady I mentioned earlier is one of them. She claimed I was her best friend yet wouldn’t answer her phone or wouldn’t want anything to do with me unless it benefited her. After years, yes years, of being hurt I have to let go. It’s hard. I will write her a letter to explain. Any ideas? My children are older. They’re 14, 11 and 7. They all have chores. We work together to clean up before we go to bed. Some nights we don’t but more than not we do. It’s so lovely to have routines. I love schedules and it helps my family function better. I’m beginning to wake earlier to take time for myslef. I’d love to read my Bible when it’s quiet. I cook my husband breakfast each morning and so we have that time together. He leaves for work at 6:00 am and I head off to work soon after-I work at my children’s school. After the youngest started all day I was so lonely and bored! Having the same work and school schedule is awesome. They attend a small school. Pre-K through 12th is together. I can see them and know they’re okay. I get off of work 2 hours before they leave school so I can run home and get dinner going if I hadn’t already before leaving in the morning. Thanks for your blog. You’ve inspired me to cook for my family and to be self sufficient. We’re a work in progress but getting there. Wonderful tips here – we have been working at really simplifying our lives in this last year. We just recently went through our closets and got rid of so much – your right, it is nice to be able to actually see what’s in there. I’ve also found the value of making a shopping list and not dashing to town for one or two things. It’s made life easier even if we have to be more creative sometimes. I’m happy to have found your article on Pinterest today. I’d missed it. Having less stuff lets us “live”more. I’m recovering from a broken pelvis so I’ve been online more than usual. I’m going to use “no electronics after supper.” I should be putting my time to better use so I’ll be knitting. I have two mantras that keep my life balanced and functioning. “Always wear comfortable shoes”. I find that you can deal with anything more effectively if your feet are the right temperature and not being pinched. “Never leave a room empty-handed” As I go from one room to the next, there is usually something in the room being left that doesn’t “live” in that room. Take it with you, even if only partway, or to the bottom/top of the stairs. Next time you’re going up/down stairs, pick it up and take it the rest of the way. That way every movment through the house by every family member (even toddlers can carry a lego brick or stuffie back to its “home”), is contributing to keeping the home organized and reducing stress. My kids were raised with these and both now keep an organized and low-stress home and they are happy for it. These are great tips! We just moved recently and we got rid of about half of our stuff. It felt great getting rid of so much, but I’m ready to go through each room and get rid of even more. Oh . . . my. What a joyful collection of wisdom and encouragement from everyone. My hubby and I have also been on a simpler living journey the past two years. We had strayed very, very far lifestyle-wise from our early years of marriage when we built our one room log cabin home in Alaska’s wilderness. Being intentional in editing our belongings (starting w/three trailer loads of larger furniture from basement to local auction house), editing again, and then again has yielded space, clarity, and peace. Completely worth the time investment for decisions & action. I am very grateful to have come across yourarticle. My husband and I are just beginning our journey towards a simpler lifestyle and getting by with what we have, without the excess and stress. Today I really needed the reassurance that what we are doing is the right thing so I really appreciated your article! In an effort to cut back on expenses at the time of my early retirement, I decided that I truly only needed my cell phone for emergencies. Both my husband and I now have pay as you go (tracfone) cell phones. We were paying nearly $100.00 a month and now pay just over that for an entire year! The thing that surprised me the most is how much less stressful it is without being constantly interrupted by things that can easily wait. You article grasped my attention because I just wrote a post about my morning routine and how important it is to start my day right. I agree with every point in your article. Thank you for summarizing it so nicely and clearly. I do pretty much everything you mentioned. Except for kids. I don’t play with them because I don’t have kids. I have been getting rid of a lot of stuff. We moved our TV upstairs a few months ago and we haven’t turned it on ever since. Life is so much better without it. There are a couple other things we do. We grow almost everything we eat. Not only veggies, but meats and eggs too. I can (as in canning) all year round. I make lunches in jars, put them away in my larder/pantry and we open different individual lunches. For example, I canned pork and beans last Friday. It took me 2 hours of soaking beans while I cut the meat and got the jars ready. And then I pressure canned individual pint jars for an hour. All you have to do now is grab a jar and go. It saves cooking time and energy (I mean electricity). And you don’t have leftovers. Canned lunches can sit on the shelves for months. I make our clothes. I sew and knit. I make the clothes exactly to our liking. That way, every piece is the favorite. We do most of our shopping for things online through reliable sources. This reduces all my shopping to buying milk, sugar, flour (I bake bread), feed for animals, and stuff like that. I really want to get a couple of goats. They need care, but they will simplify our lives even more. I am hoping that they will eat my grass and we won’t have to mow so much. I am also hoping to get some goat milk. It’s delicious and healthy. I want to make cheeses, goat milk soap, yogurt, and other goodies. Being connected with nature is the best way to simplify life. Whether it’s walking, working on your garden, or riding a horse. I love these ideas and actually practice a majority of them to one extent or another. I struggle though with the fact that I work at the hospital 3 to 11 pm as a nurse an the house and three kids are left to my husbands care and my idea of clean ready for bed is a bit different then his. Now we have a 4 years age different (me being the older) and because of this difference I am farther down the path to simplicity then him, this can present issues with gutting and cleaning. Thankfully he finally reach the age I did when I wanted to get rid of more and more. I just want to say I have followed you for a long time i love you site ,i always find neet new things to learn ,try and have fun doing ,you inspire me with all the good simple life things you have on hear ,thank you so much for shareing ,I dont know if you have a pintrest or not but I like things on my pintrest also ,I am a Home school mom and I have found alott for me to do with my 13 year old as well ,keep share its great ,God bless you and your family . Great ideas! Do you have the ‘single working mom’ version? 😉 I work nights, two older decided to attend school, my 8yo stays home so she’s unschooled. It’s a toss up, coming home from work, exhausted, spend time with her and clean. Older two get home at 5pm. If I can’t stay up that late I leave dinner in fridge and go to sleep. But we ‘have’ gone simple and tossed a lot of stuff when we moved, after my husband passed (he had a lot of junk) and I am on all cash and learning how to cook from scratch…so kind of there;) oh, I spend time with my two older ones on the weekends when they’re off school. Anyone else doing this single? ok I love everything about this!!! Thank you for the wonderful reminder that the simple life is an amazing life! Love finding your blog! I stumbled across this blog post on Pinterest. I love every bit of it. Thank you so much for this! Hi, I really enjoyed your article, I wish more people would read it. About 3 years ago I moved from 2400 square foot monstrosity of a house into a 2 bedroom, 1 bath home. There are 4 of us, myself (obviously), my husband and two daughters. My life is so much easier and happier that its hard to put into words. I was in chaos before, decorating and heating rooms I never used, high mortgage payments, tax bills, maintenance and worst of all I had to pay for a cleaning person and landscaper while I shlepped off to work. I literally did not have the time to clean the house to the degree that most would find acceptable and, I didn’t want to. I got to the point where I was working to pay other people to take care of my life. What a miserable joke. The problem is many of my friends and relatives treat me as if I fell off a turnip truck. They can’t believe my daughters have to share a room and we only have one bathroom when we used to have 4. The truth is, if I could do it all again, I would’ve bought a small home and lived there forever. The debt we incurred for living like other people expected, is still impacting us. I can’t wait till this sustainability movement really takes hold. Smaller homes require less work hours and more quality of life. I don’t have to work extra hours, my husband was able to take a less demanding job and I find myself smiling more than screaming. Our stress level decreased and our happiness increased exponentially. Thank you for encouraging people to simplify. Enjoy! I keep a box by the door and anytime I come across something that needs to go I toss it in there. When it is full I take it to our local thrift store. It’s a non-profit that is run by volunteers and the money goes to help people in my area that need it. They also run a food pantry. They do wonderful things for people. As for the negativity, I believe that I made the hardest decision ever while working on having negative people in my life. It is sad, but I am actually doing a lot better ever since. I had to disown my mother. No judgement please. There is a long story there. But trust me, it was necessary to gain some peace and happiness. I love this so much!! Thank you for writing it!! I’m a professional organizer and I have shared very similar points with many clients. Reduce the stuff, clear mental clutter, and be present – the good life! Turning 50 in 2016 and want more out of life with less! My husband left his job of 32 years as a copier tech to do his love for rustic woodworking and it’s been a blessing! This is a great article and right now enjoying my morning time before my family gets up. I crave disciplining mysef to meal plan each week and cook/freeze food for the winter as I work for a CPA office and need to stock up before tax season hits. Yes, being focused on play is true – love time with my daughter and doing diy crafting with her and my nieces & nephews – such quality time! Have a wonderful Christmas season! Your blog is a gold mine, seriously. My husband and I are on our journey into a simpler, less consumer-driven life and we’re working on everything you mentioned here (except we don’t have kids yet, but those are good things to keep in mind for when we do!) Thank you so much for sharing your wisdom! I’m documenting our journey at wishesandwhims.com and I would LOVE it if you’d stop by to give some advice! Thank you again. Reading your Pin gives me hope for this great country. There are loving responsible individuals who love their families and have work ethics and values that can strengthen those around them. Hooray for you and whatever makes you tick!!!! The world needs more where you came from! I love your ideas. My 4 children are grown now, but we raised them in a house with 1 bathroom. Planning and organization is the key. They all learned to share and everyone had to work as a team. Our house is small–causing everyone to interact.I had to get our morning stuff ready the night before and it truly made mornings much easier. As exhausted as I was at the end of the day, I knew I had better do it. That took away much of the stress of getting out of the house in the morning. I made all of the lunches the night before, everything was stacked in the fridge ready to go. The oldest 2 got on the bus at 6:30, my younger 2, who are twins, caught the bus at 7:15. Now, at this stage of my life, I, as many of you are, am looking to simplify. Thanks to all of you for sharing your ideas. 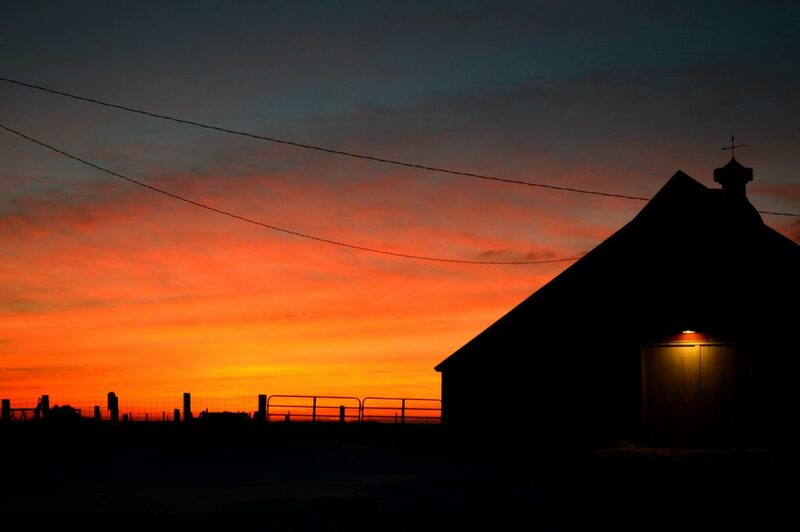 Simpler living happens easiest when the population is small, the rural price tags low so no mortgage, debt free can happen. Love your posts! I’m almost 67 and wondering if I am to old to start this lifestyle! Reading this article gives me a sense of peace, so I may try to implement some of your ideas! Thanks for your insight! Thanks for taking the time to compile it! So many amazing blogs all in the one place! Good read! I like that you mention meal planning and cutting out short trips. If you plan well, there is more margin time for the most important things. You are so right, so right, so right! Even as a farmer….. My biggest problem…… So many choices!!! This post is still very helpful to me. I have read it more than once. This sounds amazing. I love how you explain it. I will take down the steps and start to do it. Thanks for helping! Thank you for sharing this article. This article is still very helpful to me. Thanks so much for sharing at Inspire Me Wednesday. I love how you explain it. This sounds amazing.